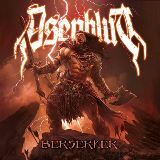 Compared to some albums which are convoluted and difficult to describe Asenblut's Berserker is a picture of directness. There is not much subtlety to what these Germans are trying to portray. Thunderously produced, especially in the bottom end, harsh riffs, dual vocals composed of manly growls and occasional higher vomit shriek, Asenblut come off very much sounding like Amon Amarth Jr. Yet the band is not just satisfied with the picture of strength and manliness. Apparently an entry into the evidence folder that Germans can count as Norsemen too, Asenblut are a bunch of Vikings drinking in equal amount from caffeinated power and modern sound slickness, compensating with masculinity and polish where creativity may be lacking. To say Berserker doesn’t lack energy is to say nothing. This ride simply does not know where the stop button is. A catchy riff (Titanenerbe) or a cool melody (Offenbarung 23) to open a song, in the end of every cut Berserker is inevitably about to bulldoze you over. Olavi Mikkonen would have been proud of the opening melody in Drachenborn, and even if pride is not an entirely appropriate term to use while listening to your own signature mid-song tremolo in Des Alchemisten Elixier, then at the minimum he could be nodding his head in approval. But then, again, the album is not about soaring tremolo melodies either. It is about how much bruising you can take. There is no slowdown, no reprieve, even if there are hints of mid-song meaty gait here and there (Drachenborn, Bittere Wacht). If you were to look for variety in Berserker, look away. The different riff pattern won’t appear until the very end (Auf Grauen Schwingen), and even a single-worthy Berserkerzorn, with its standout staccato lead, is presented twice, to do the same thing in two different languages. And therein lays my trouble with Asenblut. Somewhere by Schatten uber Arkham I was tuning it out. You would not pay me to put it on the repeat listen. The album is certainly cool in the moment that it lasts, and I would not mind Asenblut to open in front of a bigger act with a pair of their best tracks. But to play this over and over again? The mind will atrophy pounded by the double bass, while desperately seeking memorability which just would not come.